On January 23, 971, troops of the Chinese Song Dynasty managed to defeat the War Elephant Corps of the Southern Han Kingdom by the use of deadly crossbows. In those days, elephants were the equivalent of today’s tanks and were a fearsome and seemingly unstoppable force on the battlefield. There was nothing else like warrior pachyderms until tanks were introduced in World War I. The crossbow, consisting of a horizontal bow crossed by a straight stock held by the bowman, had been invented in China perhaps as early as the 4th century B.C. or even earlier. The string would be held back by a lock-and-trigger mechanism that when released would launch the bolt (arrow). These could range in size from one-hand “pistol” type weapons up to giant “ballista” siege weapons that could launch giant bolts sometimes several feet long and up to nearly 200 pounds against fortifications! These were much more precise than other types of ancient artillery such as the catapult or trebuchet. Ballistae had a range of 300 to 1,200 yards and were even used on ships against other ships. The advantage of the crossbow is that once the bowstring is set, the bowman does not have to struggle to hold the string back but can wait until he has properly aimed to release the bolt. By using a crank or lever type of cocking mechanism, the bowman can load the bow with tremendous stored energy, thereby launching the projectile at such a high rate of velocity that the steel-tipped bolt can pierce armor. The other huge advantage of the crossbow is, unlike the longbow which takes several years of training and practice to develop the skill and strength needed for warfare, that it is easy for a beginner to master. The Medieval crossbow was so effective and deadly that there were strong feelings that Christians should not use such weapons against other Christians. Such proscriptions, however, went by the wayside when battlefield practicality came into play. Crossbows fell out of favor when firearms became common, although today modern militaries (including the U.S.) use crossbows to launch grappling hooks and ropes and many crossbows are still also being manufactured for hunting, often mounted with rifle-type scopes. 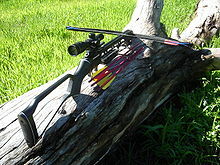 Crossbows cost about what a cheap rifle costs and are easy to learn to use. The author strongly recommends them to hunters looking to extend their hunting season and who want to try something different. The author has taken 2 white-tailed deer with a Horton crossbow and can attest to their effectiveness and accuracy. Toy crossbows are even available for early exposure for future hunters. Question for students: Have you ever used a crossbow? Gallwey, Ralph Payne. Crossbow Mediaeval and Modern Military and Sporting. Holland Press Ltd, 1814. O’Bryan, John and Barry Orkin. A History of Weapons: Crossbows, Caltrops, Catapults & Lots of Other Things that Can Seriously Mess You Up. Chronicle Books, 2013. Previous ArticlePennsylvania State Treasurer Shoots Himself on TV! Next Article Newsflash! King Tut Loses Beard!